Mike Harris was the creator of Firstdirect, the world’s first 24/7 telephone bank- which launched in 1989. Firstdirect is famous for delivering consistently outstanding customer service. 10 years later Mike launched internet bank Egg which he took from concept to a £1bn public company within 3 years. In between he was Chief Executive of Mercury Communications and Chairman of mobile phone company One to One. Mike was a regular speaker at the mid career MBA course at MIT from 1996 to 2008 and was Chairman of the Innovation Board at Royal Bank of Scotland from 2005 until March 2009, where he supervised the establishment of a group wide innovation programme. During this time he was also a founding investor and Chairman of digital identity company Garlik until its sale to Experian in December 2011. In 2012 he co-founded Monument Partners, a boutique consultancy, focused on investment opportunities in Africa and South America. Aside from Monument, Mike now offers coaching, workshops and mentoring programmes under the IconicShift brand for emerging businesses with game changing potential. 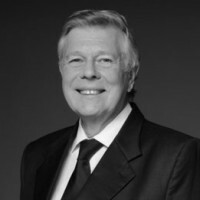 He is also Chairman of the FEBE network (For Entrepreneurs by Entrepreneurs) – an alliance of experienced mentors working together to find and support the next generation of UK global growth companies.